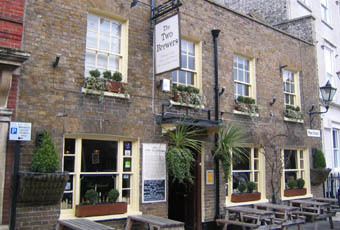 Made a return visit to the Two Brewers on Wednesday evening and managed to get a table this time. It always seems to be packed. Still full of character, especially when it's dark. There were plenty of people for meals. The only disappointment for me is that the 3 ales remain the same all the time - Pride, Doom Bar & Tribute. Pub number 3 and even though it’s a decent pub with a lovely interior it was the most disappointing of the day. A combination of being Bank Holiday Monday and very nice weather the outside seating area to the front was packed and it was pretty busy inside too. However the first thing I notice on entering the pub is the extremely strong smell of fish. I know it’s lunch time but the smell is really strong and off putting, it made me grab my drink and head outside. On the drink front there were 3 ales on cask which were Fullers London Pride, Sharp’s Doom Bar and St Austell Tribute. Not fancying any of these I went for a pint of Orchard cider. Back to the interior, there’s plenty regarding old history on the walls along with a large amount of books, a very decent collection of matchboxes and most importantly The Royal Standard which was hanging from the ceiling. Being by the entrance to the park this pub does attract a lot of tourists. The pub is externally well kept with lots of attractive hanging baskets and is very welcoming to said tourists…however it’s not a pub I would rush back to as it’s now been ticked! 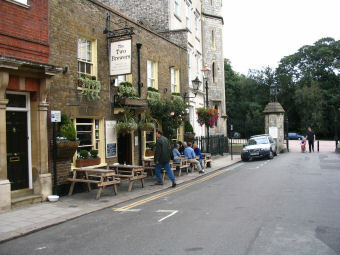 Fantastic little pub at the end of the main street in Windsor and adjacent to the Long Walk. Tourists to the town must love this pub. It's an archetypal English pub with 2 small rooms and loads of character. It was very busy late yesterday evening with a mixture of locals and tourists. It does serve real ale (Doom Bar, Tribute & London Pride). But the main reason to visit is to savour the atmosphere. Probably a 9/10 for the pub but only 4 or 5 for the beers. So 7/10 for me. This pub is fab. Its a genuine, proper pub, whereas many other pubs in central Windsor are much 'yoof bars' - and not very good ones at that! There is one fly in the ointment whoever. The surly staff. The long serving bar maids, actually - one in particular, will growl at you for no reason whatsoever. I don't need to be brown nosed, but the occasional hello, excuse me, or even, perhaps, just a little smile - would be an easy give. The brusque, curt, non engaging manner does not make me want to return to this otherwise very pleasant pub. Scored it a 6, would have been a 9 if not for the rottweiler on diazipam attitude.